[209 Pages Report] The global digital oilfield market was valued USD 20.10 Billion in 2016; it is projected to reach USD 27.10 Billion by 2022, growing at a CAGR of 5.09%, from 2017 to 2022. Investment for digitization of oil & gas fields are increasing for enhancing their workflow process, for optimizing production, thereby meeting the product forecast and improving profitability. Europe and North America are expected to be the largest markets for digital oilfield during the forecast year. The regions such as Asia Pacific, Africa, and the Middle East are expected to drive the growth of digital oil field market. This research study involved the use of extensive secondary sources, directories, and databases, such as Hoover’s, Bloomberg Businessweek, Factiva, and OneSource, to identify and collect information useful for a technical, market-oriented, and commercial study of the digital oilfield market. Primary sources are mainly industry experts from the core and related industries, preferred suppliers, manufacturers, distributors, service providers, technology developers, standards and certification organizations of companies, and organizations related to all the segments of this industry’s value chain. The points below explain the research methodology. Assessment of future trends and growth of digital oilfield based on process, application, and solutions. After arriving at the overall market size, the total market has been split into several segments and sub-segments. The figure below illustrates the breakdown of primaries conducted during the research study, based on the company type, designation, and region. The key players in the digital oilfield market include integrators such as Schlumberger (US), Weatherford (Switzerland), Halliburton (US), BHGE (US), National Oilwell Varco (US), and equipment providers such as ABB (Switzerland), Emerson (US), Rockwell (US), and Siemens (Germany). The global digital oilfield market is expected to grow at a CAGR of 5.09%, from 2017 to 2022, to reach a market size of USD 27.10 Billion by 2022. The increase in production activities in the Middle East region, the presence of unconventional reserves, and growing investments in offshore in the Asia Pacific region are expected to be the key factors driving the digital oilfield market during the forecast period. The report segments the digital oilfield market, on the basis of the process into drilling optimization, reservoir optimization, production optimization, and others. The others segment includes asset management, maintenance & repair, and safety management. The production optimization segment led the digital oilfield market by process from 2017 to 2022. Employing real-time techniques for production optimization increases the recovery of oil and reduce the non-productive time. The ongoing market dynamics, where there has been a constant fluctuation in the oil prices, requires focussing on reducing the non-productive time and improve workflow efficiency with the use digital oilfield solutions. The global digital oil field market, by application, has been segmented into onshore and offshore, with the onshore segment growing at a faster pace. The complexity in deepwater drilling, along with the increasing adoption of digital oilfield techniques in regions such as the Middle East, and North America, where the maximum of the oilfields are located onshore, are expected to drive the onshore segment. Thus, the increasing production activities in these regions and reduction of non-productive time is expected to drive the onshore segment at the highest rate during the forecast period. The report further segments the digital oilfield market, by solution, into hardware solutions, software & service solutions, and data storage solutions. The hardware segment is estimated to grow at a faster rate from 2017 to 2022. The investments by oilfield operators towards technology enhancement and process automation enable the companies to eliminate non-productive time, optimize production, and enhance control & monitoring of oil & gas fields, thereby driving the hardware market during the forecast period. 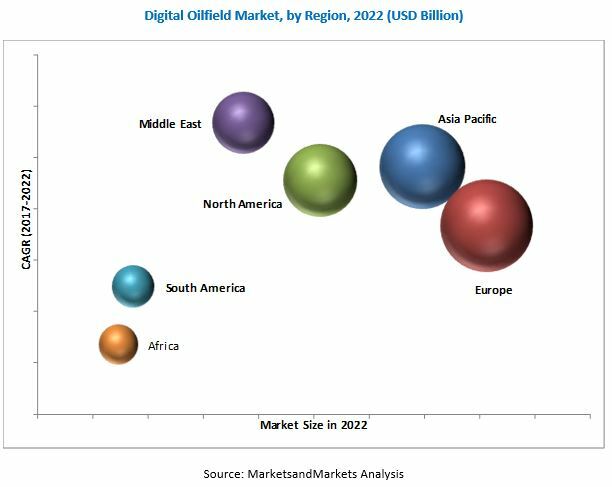 In this report, the digital oilfield market has been analyzed with respect to six regions, namely, Europe, North America, Asia Pacific, the Middle East, South America, and Africa. Europe is expected to dominate the digital oilfield market during the forecast period as the region has several mature fields in the North Sea which demand increased use of technological prowess to produce oil. The high number of mature oil & gas fields leads to the increasing demand for digital oilfield solutions such as well intervention and enhanced oil recovery (EOR) techniques. The figure below shows the projected market sizes of various regions with respective CAGRs for 2022. The major factor restraining the growth of the digital oilfield market are the fluctuating crude oil price, and the data security/cyber-threats combined with resistance by operators toward adoption of new technology. Some of the leading players in the digital oilfield market include integrators such as Schlumberger (US), Weatherford (Switzerland), Halliburton (US), BHGE (US), National Oilwell Varco (US), and equipment providers such as ABB (Switzerland), Emerson (US), Rockwell(US), and Siemens (Germany). 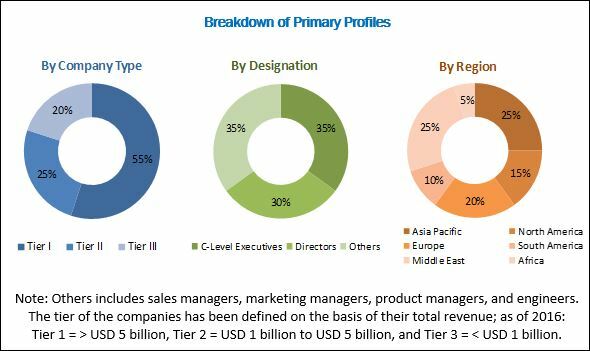 These players have adopted growth strategies such as new product launches, contracts & agreements, partnerships, collaborations, alliances, and joint ventures, mergers & acquisitions, and investments & expansions to capture a larger share of the digital oilfield market.